Alyaa has always been interested in how things work and how objects impact a person’s everyday life. She has had a passion for chemistry and math since the 3rd grade and has found a way to implement it as her job and her passion. Alyaa grew up in Alexandria, Egypt and attended New York University’s Tandon School of Engineering for Chemical and Biomolecular Engineering, BS. 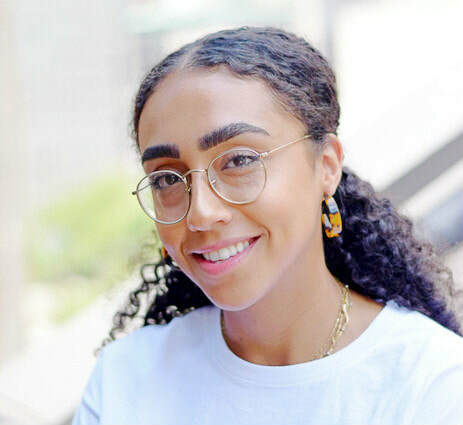 Throughout her years at NYU, Alyaa found ways to channel her love for chemistry by doing polymer research for two years and participating in materials bridge building competitions. Now, she is happy to be a part of the Link3D team as a material scientist and sales development engineer. I’m a proud Egyptian and love talking about my roots. I grew up between countries, constantly moving back and forth. I am lucky to be trilingual learning Arabic, English, and French simultaneously growing up. I am the person I am today because of where I came from and, of course, because of my parents. First Job: Working as a barista in a local midtown coffee shop where I became a master coffee artist. I was a part of a small team and really learned a lot about teamwork. That is how I met Shane and learned about Link3D, and the rest is history! My Childhood: I was born in Egypt and spent most of my childhood at the Mediterranean Sea. I loved being at the beach and still do. I was a very creative child and before I knew what chemistry was I was always drawing or painting. I continued to paint throughout my whole life to keep my creative side flowing. ​Random Facts: I was a NJ state finalist in Science League and I came in 4th place in the National Congressional Art Competition all in the last week before graduating high school. So you could say I always gave my all especially when doing the things I love.